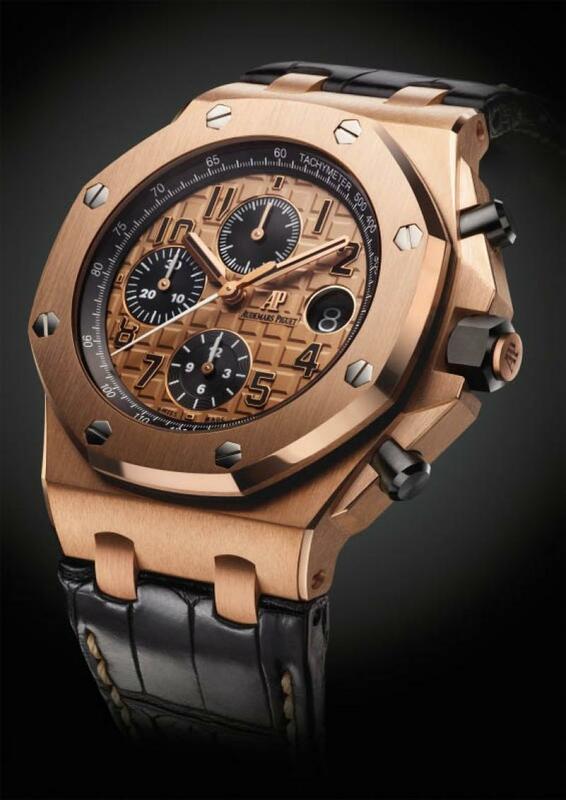 The Royal Oak Offshore Chronograph is one of the signature watches in the Audemars Piguet Range. This watch is the “sports version” of the Royal Oak, which the company launched in 1972. 42.00 mm 18-carat pink gold case, glareproofed sapphire crystal and caseback, black ceramic screw-locked crown and pushpieces. Pink gold-toned dial with “Méga Tapisserie” pattern, black counters, black Arabic numerals with luminescent coating, pink gold Royal Oak hands with luminescent coating, black inner bezel. Hand-stitched “large square scale” black alligator strap with 18-carat pink gold pin buckle. Chronograph, hours, minutes, small seconds, date. Calibre 3126 / 3840 Manufacture.